로이킴은 지난 25일 정오 공개된 첫 정규앨범의 타이틀곡 ‘러브 러브 러브(Love Love Love)’로 멜론을 비롯한 엠넷, 올레뮤직, 벅스, 네이버뮤직, 다음뮤직, 몽키3, 소리바다, 싸이월드뮤직 등 국내 9대 음원사이트 실시간차트 1위를 휩쓸며, ‘봄봄봄’의 영광을 재현했다. 로이킴의 앨범 제작 및 매니지먼트를 담당하는 CJ E&M 음악사업부문 측은 “가장 로이킴스러운 음악으로 만들어진 그의 첫 정규앨범은 오랜 시간이 지난 후에도 찾아듣고 싶을 만큼, 최고의 소장가치를 지닌 앨범이 될 것”이라고 밝혔다. 또 로이킴은 27일 Mnet ‘엠카운트다운’에서의 첫 컴백무대를 선보일 예정이며, 곧바로 컴백 스페셜 프로그램 ‘로이킴의 러브 러브 러브’ 특별 편성으로 시청자들을 찾아갈 예정이다. 이밖에 로이킴은 7월6일 부산 공연을 시작으로 13∼14일 서울, 19일 대전, 20일 대구까지 총 4개 도시 투어 단독 콘서트를 갖는다. 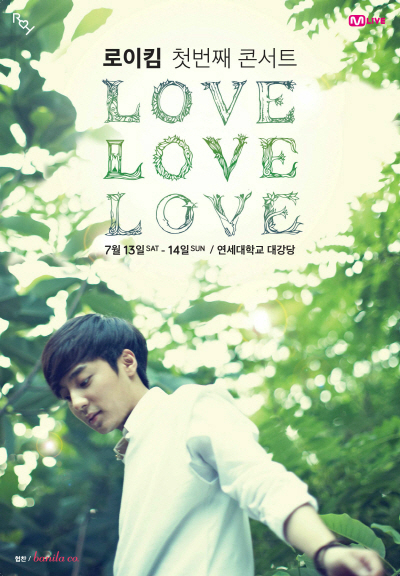 Roy Kim, Love Love Love made a clean sweep of the nine music charts. Roy Kim released his first album last June 25. The title of the song ’Love Love Love’ made a clean sweep of 9 real-time music charts MNet, Alleh Music, Bucks, Naver Music, Daum Music, Monkey3, Sori Bada, Cyworld Music etc as well as Melon. He revived the glory of ’Spring Spring Spring’. CJ E&M which is in charge of his album production and management said "His first album is made as a music like the most Roy Kim and it will be the one that has the best value of possession as to want to listen to it after a long time." Roy Kim is planning to show his first comeback on stage on Mnet ’M Countdown’ on June 27, and appearing the comeback special program ’Roy Kim’s Love Love Love’ immediately. Also he’s having his own concert going around 4 cities in Seoul on July 13, 14, in Daejeon on July 19, in Daegu on July 20 starting the concert in Busan on July 6.